Toledo's Kareem Hunt is a very underrated player among the 2017 running back class. It's college bowl season, and as long as you're taking in some college football action this Saturday afternoon/evening, here are some players who could make some sense for the Philadelphia Eagles in the 2017 NFL Draft. Steven Taylor, LB, Houston (6'1, 225): Houston vs. San Diego State, Las Vegas Bowl Presented by Geico, 3:30 p.m.
That's a playmaker. As you can see, perhaps the most impressive thing about Taylor's numbers above is that he has 22.5 sacks the last three years from his linebacker spot. As you might imagine, Taylor is an outstanding blitzer. I do wonder if other teams will value him more than the Eagles, seeing as the best thing that Eagles linebacker Mychal Kendricks does is blitz, and he has rushed the quarterback just seven times this season. Perhaps the counter argument would be that if you're going to spend, say, a third-round pick on Taylor, he would be a replacement not just for Kendricks, but also a starter who would take over at OLB for Nigel Bradham, and therefore would have more opportunities to get after the quarterback. At any rate, Taylor is an aggressive player in the Jim Schwartz mold, however, he also plays under control and isn't often fooled by play action or misdirection. Nico Siragusa, OG, San Diego State (6'4, 330): Houston vs. San Diego State, Las Vegas Bowl Presented by Geico, 3:30 p.m.
A season ago, the Eagles made San Diego State RG Darrell Greene the highest paid undrafted free agent in the NFL. This year, San Diego State LG Nico Siragusa is a much better prospect, paving the way for RB Donnel Pumphrey (previously profiled here), who has amassed 2018 rushing yards this season for the Aztecs. Siragusa has accepted an invite to play in the Senior Bowl. There's no question he can anchor against bull rushers, but NFL people will want to see how he holds up against quicker interior pass rushers. 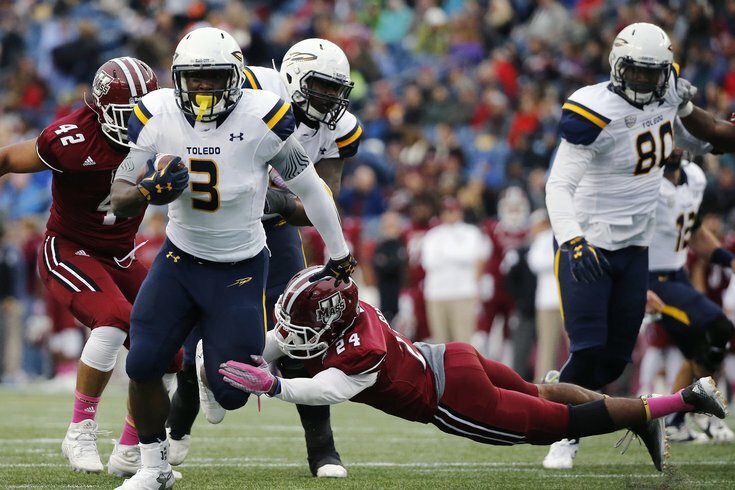 Kareem Hunt, RB, Toledo (5'11, 225): Appalachian State vs. Toledo, Raycom Media Camellia Bowl, 5:30 p.m. Through his first three seasons at Toledo, Hunt wasn't much of a threat as a receiver, but as a senior he caught 39 passes for 377 yards and a TD. On those 760 career carries, Hunt has a grand total of one fumble, which was in 2013. In a running class loaded with talent, Hunt could potentially be available a little later in the draft than he should be. If he's still somehow sitting there in the fourth round, that would be outstanding value. Michael Roberts, TE, Toledo (6'4, 270): Appalachian State vs. Toledo, Raycom Media Camellia Bowl, 5:30 p.m.
Roberts isn't the fastest guy, so you're not going to get many big plays down the field from him, but obviously has been very good in the red zone for Toledo. The Rockets also often use Roberts on occasion in something of a fullback-type role out of the shotgun, in which he'll line up two yards behind the offensive line and lead block for Kareem Hunt. There's some good, some bad with Roberts' blocking, but there's something to work with there. As we noted last week, Doug Pederson wanted to keep four tight ends coming out of training camp, but Chris Pantale simply was not worthy of a roster spot. In a draft class loaded with tight end talent, a guy like Roberts could be available in the mid-to-late rounds. Elijah McGuire, RB, Louisiana Lafayette (5'10, 208): Southern Mississippi vs. Louisiana-Lafayette, R+L Carriers New Orleans Bowl, 9:00 p.m. If you'll notice above, McGuire isn't just catching screen passes. He's catching passes deep down the field like a receiver. Also note that he has a little Shady in his game with his cutting ability.